The excellent Tooting & Mitcham programme brought back memories of the only ever time that we have played away at the home of this club with a prestigious past history. The occasion was in November 2005 when they beat us 3-1 in the 4th Round of The London Senior Cup. We were in a good run of form at the time and our hopes of continuing to make progress in the competition seemed good when Ricky Pither put us in the lead in the 24th minute and we still led at half time. Tooting drew level in the 56th minute and then missed a penalty but they went ahead and then made sure of victory with a third goal in the 88th minute. Other than Ricky, we had in our side Chris Mills, Antony Rowlands, Mark Sroka and Gary Brown all of whom gave the club great service over the years. We have played Tooting at home twice this season and have been beaten both times so we went into this game anxious to break our duck in terms of points gained in our games against them. Our side showed just one change from that which had beaten F C Romania seven days previously with Will Wambeek coming in at left back instead of Jack Waldren as we switched to a defensively minded 4-4-2 formation with four centre-backs in our back line. On a sticky playing service, there was very little to enthuse about in the opening thirty minutes with neither side putting together any constructive football with the ball seemingly spending more time out of play than on the pitch. The one decent moment saw an excellent ball by Tooting's number ten Daryl Coleman inside Harry Tamplin into the path of Danny Bassett but his weak cross was safely cleared away. At the other end a free kick by Tom Collins from virtually the same position from where he had scored twice the previous week saw the ball just clear the Tooting crossbar with the Tooting keeper David Trivino straining to get a hand to it. Keiran Cathline then added to his list of disciplinary points with a completely needless foul when no danger loomed way out on the left flank close to the half way line. Danny Julienne whose effect on the game strengthened as time went on then played a good ball forward into the path of Gareth Chendlik but Gareth volleyed the ball high over the bar. Rather belatedly, the assistant referee then raised his flag so even if Gareth had scored, the goal would have been disallowed. We finished the half with the upper hand, a fierce shot by Keiran being deflected just wide and then Tom with a shooting opportunity drove the ball high, wide and not so handsome and the half finished with Tooting's Antonio Simeone being shown a yellow card for bringing down Harvey in mid-field. The general consensus of opinion in the Tooting boardroom was that one goal either way was likely to decide the game and inside the first few minutes, Tooting could have scored what might have been a vital goal. An inswinging corner by Peter Wedgeworth from the left was completely missed by the Tooting skipper Sol Patterson-Bohner coming in on the far post when any form of contact was likely to take the ball past Aaron. Shortly after Aaron was in action for virtually the first time in the game when a fierce shot by Stefan Ilic from distance went straight at him. As the half progressed so did Tooting gain the upper hand but their sole method of trying to break down our defence was through a succession of long throws into our penalty area by Coleman. We thought that we had broken the deadlock when a good run and cross by Harvey down the left found Tom on the far post but his header went into the side netting not the net which was our immediate reaction. Both sides made a substitution on the hour mark, Brian Testolin replacing Gareth for us. Tooting's Saidou Khan volleyed the ball over the bar when the ball had been headed out into his path and then Tom Collins lost the ball in midfield ignoring better placed team mates and Coleman raced away but his fierce shot flashed across the face of our goal. With ten minutes remaining, we made our second change Harry Rush coming on for the hard-working Harvey and we were then forced into our third and final substitution when Harry limped off to be replaced by Jack Waldren. Danny became the second Town player to receive a yellow card shortly followed by Aaron, the match referee urged on by the home crowd running out of patience with his time wasting. In the final minutes a shot by Khan went just wide whilst deep into the four minutes added on after the ninety we might just have snatched victory when Harry Rush from a good shooting position saw his left footed drive fly just over the Tooting crossbar. 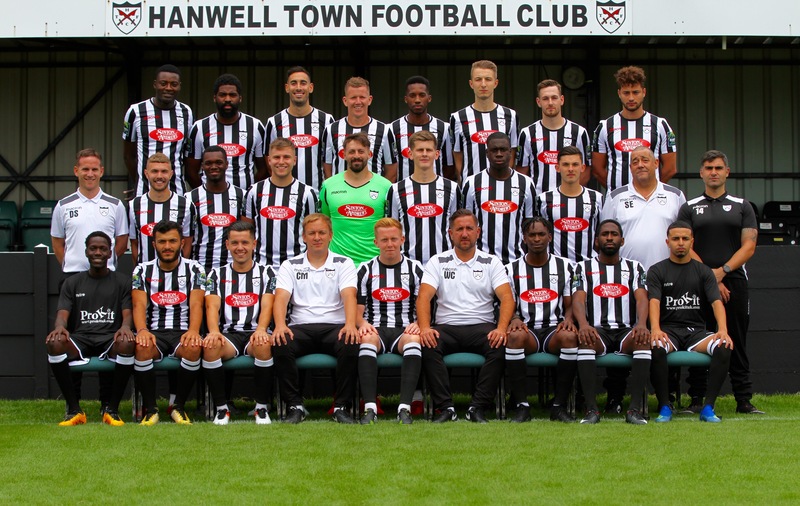 So at last we have gained something from our meetings with Tooting and it was generally agreed that we were deserving of a point with all fourteen players used working extremely hard for each other.